Exotic Ticks in New Jersey: What Are the Concerns? The discovery of the longhorned tick in New Jersey is currently primarily of concern to livestock farmers. Without a doubt, from a public health standpoint, New Jerseyans should be more concerned about our native ticks and the diseases we know they spread, such as Lyme disease, Ehrlichiosis, Anaplasmosis and others. When enjoying the outdoors, we should always follow the standard steps for protecting ourselves, our children and our pets. While in northern Asia longhorned ticks have recently become associated with a dangerous new virus, in New Jersey this tick species has not, thus far, been found to carry pathogens that can harm humans or animals and has not been observed to bite people. Haemaphysalis longicornis, the longhorned tick, is native to northeastern Asia but expanded to Australia in the early 20th century and then to New Zealand. Over the years, longhorned ticks have been spotted in livestock at U.S. ports of entry a few times but were successfully intercepted and killed by agricultural inspectors. So how did this exotic tick manage to escape detection and appear in at least three New Jersey counties and at cattle farms in Virginia and West Virginia? Possibly by arriving on a dog or cat, which are not routinely inspected. The increasing risk of tick-borne diseases worldwide and here at home indicates such loopholes should be closed. As noted above, the longhorned ticks in New Jersey have not – so far – been found to carry any pathogens. Its main danger to livestock lies in the fact that this tick can reproduce asexually and quickly reach unusually dense infestations that, outside the U.S., have been shown to weaken or even kill sheep or cattle without any involvement of a pathogen. To consider how the risks might change, we need to understand the ways tick-borne diseases arise. Newly hatched tick larvae are generally disease-free. If they bite infected animals, they may pick up bacteria or viruses but will only transmit those pathogens to the next creatures they bite if the pathogen is capable of invading and multiplying in the tick. Tick-pathogen associations can be very specific: for example, of all species of ticks in New Jersey, only blacklegged ticks have been shown capable of transmitting the Lyme disease bacterium. New Jersey white-footed mice, voles and other small mammals are very often infected with the bacteria that causes Lyme disease. Will longhorned ticks feed on these small mammals in New Jersey? If so, will they become infected with the Lyme disease bacterium? And will they bite people? Those are some of the critical questions that researchers in the Rutgers Center for Vector Biology and collaborators are addressing. A further concern is that exotic species have been shown to change over time as they adapt to their new environment. In a new environment depending on availability, an exotic vector such as the longhorned tick may focus on new hosts, which may alter their ability to transmit disease. In fact, sometimes local pathogens evolve to embrace a new abundant carrier. So, can longhorned ticks become dangerous to New Jerseyans? Maybe, but right now, in collaboration with the New Jersey Department of Agriculture, Department of Health, USDA and other agencies, we are working to detect the full extent of the infestation across New Jersey and develop strategies for containment and, if possible, elimination. One new exotic tick is one too many for New Jersey. The Rutgers Center for Vector Biology, within Rutgers University­­–New Brunswick’s New Jersey Agricultural Experiment Station, provides research, information and guidance to New Jersey’s citizens about ticks, mosquitoes and other vectors, and the diseases they transmit. The Center interprets and disseminates data collected by county agencies for surveillance of mosquito vectors and their infection rates for Eastern Equine and West Nile viruses. Population trends for state mosquitoes are reported on a weekly basis. Working closely with mosquito control officials in all 21 counties, along with the New Jersey departments of Agriculture, Environmental Protection, and Health and Senior Services, the Center continues strong traditions forged in the early 1900s which credit Rutgers–New Brunswick as the birthplace of mosquito control. Center researchers are pioneers in vector biology and integrated vector management, and interact with the public directly and through the Center’s website, the Fonseca Lab site and the Rutgersvectorsbio blog. 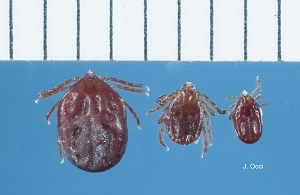 This entry was posted in Uncategorized and tagged exotic tick, Haemophysalis longicordis, invasive tick on May 25, 2018 by Lisa Reed.